In 1992, when you drove along Shellard Lane and crested the hill, you came upon a miraculous sight: a sprawling new school surrounded by cornfields, forests, grazing deer, and a few noisy ducks. Fast-forward twenty years, and Assumption College is the hub of the vital, growing West Brant community. Assumption College began as a primarily rural school serving the Catholic community of Brant County, Haldimand and Norfolk. The corner of Shellard and Conklin has gone from an idyllic rural setting to a busy intersection serving three elementary schools. 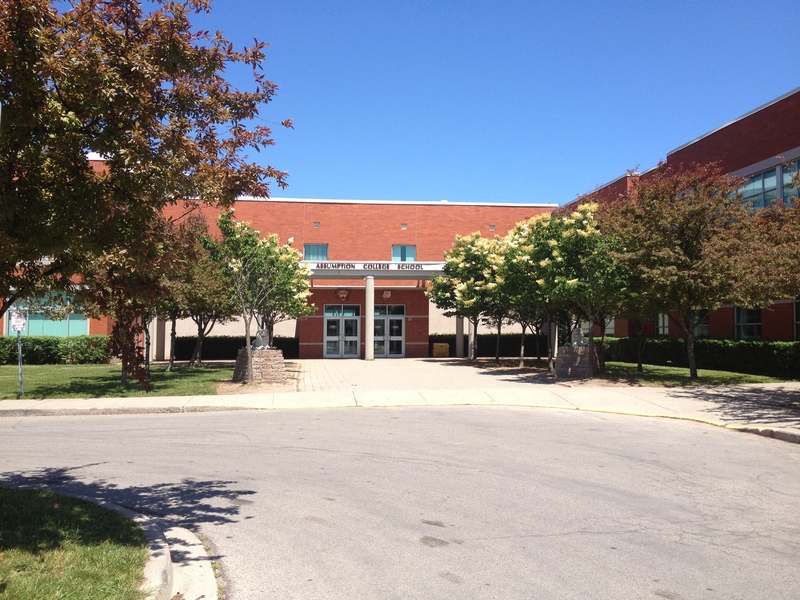 As the population of the neighbourhood grew some relief from crowding and portables came with the building of Holy Trinity in Simcoe, but still Assumption grew. In 2009 Assumption added a third floor. The little rural school has become the biggest high school in the city with a powerful presence on the field, in the gym, on the golf course, in the theatre and concert hall, and in academic life. Assumption has many signature events notably the Relay for Life, which has raised tens of thousands of dollars over the years for cancer research, and the Pennies from Heaven collection every Christmas which helps needy families in our community. Alumni, staff and students are invited to participate in the celebration of twenty wonderful years at the annual Summer Bash on June 23rd. At this celebration a Lion’s Ring award is presented to a member of the Assumption Community, staff or volunteer, who has made a significant contribution to the community. Tickets are $60.00 per couple and include a chance at $6,000 in prizes and dinner for two. 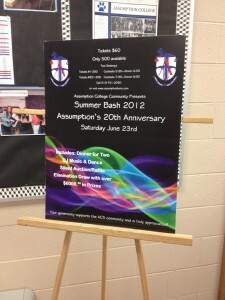 Please call the Assumption office at 519 751-2030 for tickets or ask for David Page should you need further information. Look for an article in next month’s print and online edition of The Brant Advocate for reflections on Assumption’s 20 years serving Brantford and the County of Brant by Assumption alumni and Brant Advocate Managing Editor Marc Laferriere.